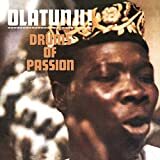 Columbia Legacy's reissue of Drums Of Passion offers a chance for new listeners to fully appreciate the groundbreaking 1959 debut CD of the late African drummer Michael Babatunde Olatunji. Hailed as a genius by none other than jazz greats John Coltrane, Count Basie, Duke Ellington and Dizzy Gillespie and referenced by Bob Dylan on his Freewheeling album, Olatunji has also toured with the Rev. Dr. Martin Luther King and influenced the rhythmic masters of later generations (Grateful Dead drummer Mickey Hart and superstar guitarist Carlos Santana). Born in the small fishing village of Ajido, Nigeria, Olatunji came to the United States to study political science at Morehouse College in Atlanta. While in school, he formed his band from a group of African expatriates as an exercise and way to help each other avoid being homesick. In 1954, he moved up north to attend NYU Graduate School. Soon, Olatunji and his band were performing throughout New York City, the five boroughs and the surrounding areas. By 1957, Olatunji and his cohorts were performing at Radio City Music Hall backed by a 66-piece orchestra. Columbia Records‚ legendary A&R producer John Hammond happened upon one of these performances and immediately signed Olatunji to the label. Drums Of Passion is an amazing and revolutionary album. It boggles the mind to think that the layers of sound were created by just four musicians and a handful of female backup singers. The drumming, though not exceptionally fast or complicated, is hypnotic. Even more amazing is the fact that Olatunji was able to re-arrange the drumming celebratory themes of his people and infuse them with American blues and jazz themes. Each track features the call and response theme (both vocal and rhythmic) that is the signature of the African musical experience. This theme is evident in Drums Of Passion and it could well be considered a cornerstone of modern jazz, R&B, hiphop and rap. Upon its release, Drums Of Passion became a worldwide phenomenon. It could conceivably be considered the first "world music" album. Unquestionably, it was the first recording to popularize African music in the west. This was never more evident than when Olatunji performed at John F. Kennedy's inauguration. Drums of Passion provides a remarkable musical bridge between African and Western culture. This newly remastered version of the classic album contains the bonus track "Menu Di Ye Jewe (Who Is This?)" which was recorded during the original sessions but was not available on the original release. More than just a great CD, Drums of Passion is a "cultural experience." Even today, forty-four years after its original release, this record will open the eyes and ears of new listeners to the vibrant nuances of traditional African music and vocals. Highlights of the original album include: "Akiwowo (Chant to the Trainman)," "Shango (Chant to the God of Thunder)" and "Jin Go La Ba (Drums of Passion)." However, each and every track is a mini-masterpiece in its own right. Drums Of Passion contains so many different tribal rhythms and elements of percussion that you can't help but be moved to the core by its ambiance, mood, tone and feeleven if you don't understand a word. Personnel: Michael Babatunde Olatunji: drums, vocals; plus additional musicians.